Gloria Lorenz was born in Barcelona, Spain then moved to Germany in 1995. 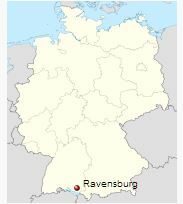 Living in a small town of Ravensburg; two hours away from the beautiful region of Konstanz. The area is planted with apple and cherry trees and populated with beautiful flowers. When there is no fog, she can even see the Alps from her house, which is something that pleases her very much. “When I was a child, I slept with a big yellow teddy bear," but it wasn't until just a few years ago that she bought a teddy bear magazine and completely fell in love with them. "In my opinion, all bears are so beautiful and I especially admire the little ones." 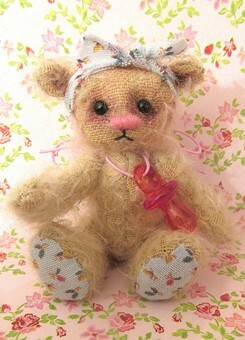 After her first attempts at bear making, by following only the instruction pages, she was hooked. 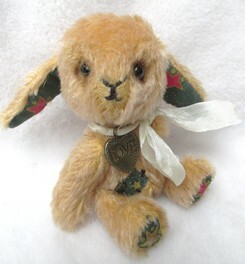 That was the beginning of her journey into the world of teddy bear making. Gloria attended several intensive work-shops and online classes, quickly learning what she needed in order to create charming bears. She does not have any helpers. Gloria knows what she wants in a bear and those ideas transform into expressive and lively looking bears! 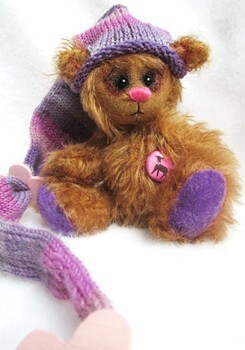 Before discovering bears, Gloria knitted pullovers for her her husband and two daughters, but now spends most of her time creating a bear or a bud weekly. Her company is named after her children, Estela and Marina. Although she has only been in the bear business for a relatively short time, she is already attending shows and has been mentioned in several magazines. 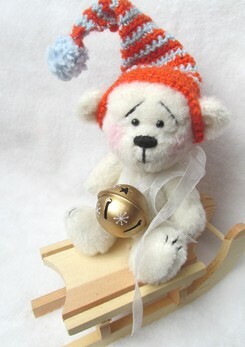 Gloria is happy when people discover her bears and see them as cute and sweet. "I think teddy bears help people return to their childhood and for me personally, it shows that dreams can be fulfilled by making a career as a bear artist."